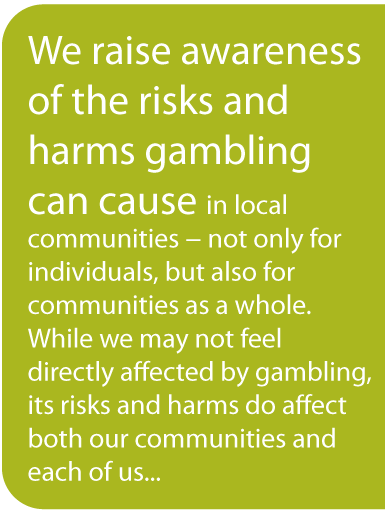 Work to prevent gambling harm can be done on many levels. The most effective is at the policy level, and impact decreases as we move down towards the individual, but all work is beneficial to some degree! 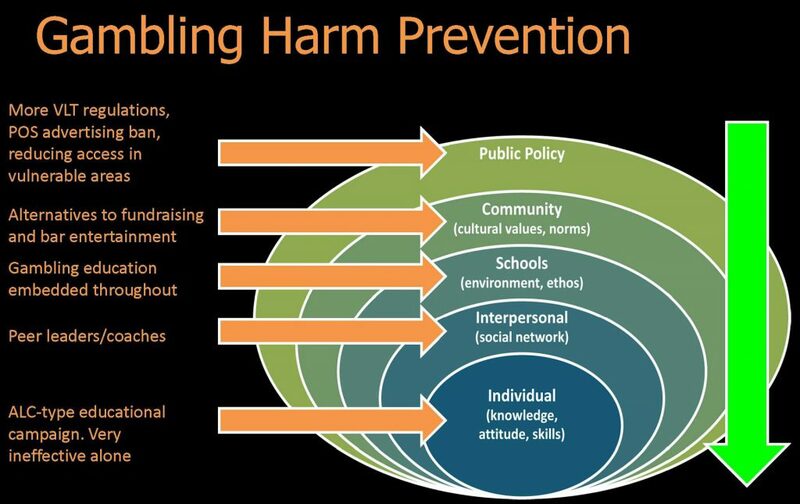 Thanks to Eric Hutt (from the Dalhousie University Health Promotion programme via an IFNS internship) for the graphic. Public Policy: VLTs are disproportionally located in lower-income neighbourhoods. Reducing the amount of access can reduce risk. Like the ban on advertising cigarettes at Point of Sale (remember the ‘Power Walls” of cigarettes and advertising we used to have all over Nova Scotia businesses? ), a similar regulation on advertising gambling would reduce risk, and reduce the normalization of gambling to youth continuously exposed to the ads. Requiring information about risks to be displayed for all gambling products and devices (like the information on cigarette packages about the risks of use) would enable citizens to make more informed choices about their use of gambling products. Community: Why are we OK with using gambling for fundraisers for our churches and local organizations? What message does that send to our children about the safety and appropriateness of gambling as a form of entertainment? Can we promote alternative forms of fundraising, and ask schools to stop having “Casino Nights” at high schools? Instead of gambling in bars, can we offer other enjoyable activities like good live music, dancing, good food, etc.? Can we help businesses decrease their dependency on gambling revenue? See our project on “Revenues at Risk” where we partnered with Acadia Entrepreneurship Centre to assist businesses to move to alternate revenue streams and stay profitable. Schools: We can include education about gambling issues embedded throughout the curriculum in our schools. For example, a study of odds in math class, of social impacts in a Social Studies class, looking at the negative impacts on business in a Commerce class, of the high costs to taxpayers of gambling harms (much higher than revenues from gambling) in a Civics class, etc. Relational (Interpersonal): The training of peer leaders and peer coaches who can spread accurate information about the potential risks of gambling. Individual: Educational campaigns directed at individual gamblers are mostly ineffective.